Calvin and Hobbes; For Better or For Worse; Doonesbury; Cathy; Foxtrot; The Boondocks….and many other comics you’ve definitely heard of would not have existed without Lee Salem, the man who edited them. About to transition to the role of President Emeritus of Universal Uclick this month. 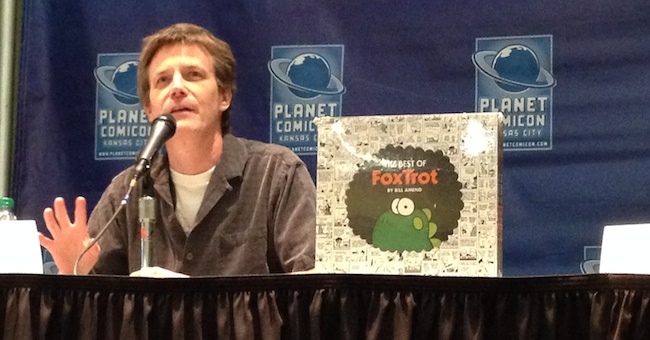 Joining Salem on the panel is Bill Amend, the creator of Foxtrot. Salem is an older man with a kind expression and a frank sense of humor. It’s soon apparent that he’s full of stories about the many cartoon artists he’s worked with, but he launches immediately into a discussion of Garry Trudeau’s Doonesbury – the first comic strip to win a Pulitzer Prize in 1975. “[Doonesbury] said something about what comic strips can and should do in the public sphere. It was a comic that pushed boundaries for its time and was controversial not for the sake of being controversial but because the characters and storyline require it,” said Salem. Eventually, the strip reached a circulation of 1,400 newspapers internationally. When looking for promising new comic strips, Salem says he’s always looking for various attributes that make up a good story. Particularly, he’s most interested in stories that “try to come up with a different approach to common themes and issues. The uniqueness of the artist’s perspective is really what should impress.” Lucas Wetzel, a columnist for the Lawrence Journal-World and comic blogger, also on the panel, maintains that the simple marriage of “good writing paired ideally with good art” makes for a fantastic comic strip. Salem mentioned the difficult working relationship with Hobbes creator Bill Watterson, but the panel soon continues with readings of statements provided by Johnston and Watterson. All statements are extremely complimentary of Salem and the Kansas City syndication under which all of these comic strips are distributed. On Foxtrot, Salem commented that it was so successful because a lot of people saw themselves through these characters. “The point of view of the strip was very different, even though it was another strip about a family. It did very well because it speaks to a large demographic of smart kids.” For these kids who aspire to become comic book creators – or artists of any kind – both Salem and Amend believe they should be comfortable poking fun at themselves. “Just keep working at it and be sure to have fun,” they say.